Killer Characters: Seasons Readings & an excerpt that's out of this world! Seasons Readings & an excerpt that's out of this world! Happy Holidays from Samantha Kidd, Madison Night, Poly Monroe, and Margo Tamblyn from Diane Vallere's various series! Samantha Kidd here. Diane’s trying to wrangle me into an adventure in Paris, which hopefully you’ll be able to read about next year. 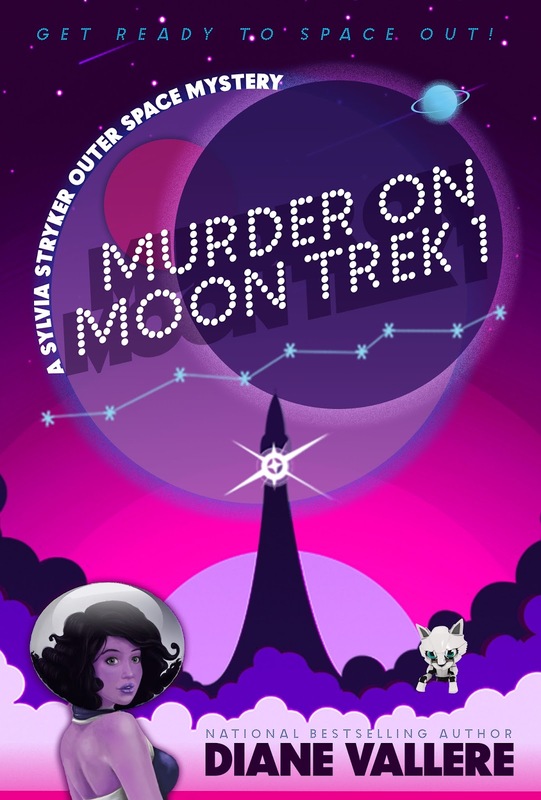 In the meantime, enjoy this excerpt from her upcoming outer space cozy mystery, MURDER ON MOON TREK 1, that comes out December 17! It features Sylvia Stryker, uniform lieutenant aboard the Moon Unit 5. Madison Night, Poly Monroe, Margo Tamblyn, and I (you know us as Diane's characters) decided to start a cozy mystery book club and read it when it comes out. Poly's giving fabric to Margo to make us costumes. Madison’s bringing the Doris Day/NASA featurette that came with The Glass Bottom Boat DVD. I offered to provide the food: a flying-saucer-shaped disc of dough with cheese and tomatoes—okay, fine. I’m bringing pizza. What? You think they don’t have pizza in outer space??? P.S. What would you bring to an outer space-themed book club meeting? Leave a comment below and enter to win a Kindle copy of YOUR CHOICE of any of Diane Vallere’s books! FOUR WINNERS, because Madison, Poly, Margo, and I told Diane there were four of us and it was the right thing to do. When Moon Unit 5 kicked off its inaugural trip from my home planet of Plunia, I expected the uniform closet to be stuffed to capacity. I just hadn’t expected it to be stuffed with a body. But here we were, light years from the space station where we’d departed, and instead of a closet of freshly laundered uniforms, I had a dead man. No matter how thoroughly I'd planned for today, I never could have planned for this. Maybe he wasn’t dead. Maybe he was tired. Maybe he’d had a late night partying before today’s departure and crawled into my uniform closet to take a nap. As unlikely as that explanation was, I wasn’t yet willing to accept the more probable reality. I knelt next to him and checked for a pulse on the side of his neck. His skin was cold to the touch, which was either due to his not-alive state or the twenty-degree difference between earthling temperatures (his) and Plunian temperatures (mine). In this case, it was both. No pulse, no breathing. A Code Blue. The Moon Unit Corporation ran a fleet of cruise spaceships whose mission was to provide relaxing getaways to one of our galaxy’s moons. Ever since I’d learned they were reopening after years of inactivity, I’d fantasized about working for them. The fact that I’d hacked my records into their system was a minor technicality. My job was to manage the uniforms during the moon trek, and as long as I did my job and avoided ship security, my fantasy would become a reality. But this was bigger than managing uniforms. Regardless of the risks to me, I had to contact the bridge. I could send a general message over the staff communication network. I stepped away from the pile of spilled uniforms and shifted to the computer that sat above the console in the middle of the room. It was standard issue, a flat black folio with colorful buttons and a low-definition screen. Only the top members of the ship and paying passengers were given high-def equipment. For the rest of us, it was the bare minimum, Moon Unit Corporation’s way of making sure distractions didn’t surround us. To the right side of the computer was a clear plastic dome that protected a shiny red button that, despite learning about during emergency protocol training, I’d hoped never to have to use. Remember! Leave a comment about what you'd bring to an outer-space themed book club meeting for your chance to win your choice of a book by Diane. Good luck! I would bring a good bottle of wine. You are so right about cupcakes! Congrats, Marla! You're a winner! I'd bring the dip and crackers in a Big Dipper. These are my new favorite thing! I would bring a UFO and maybe some potato ships. I’d bring pigs in blankets. I'd bring this book for perspective. A jar of Tang and a bottle of vodka. Hummus I love it so I take it everywhere. Congrats, Jana! You're a winner! Thanks so much for your generosity. When I was a kid they had these candies that were wafers filled with beads of candy in the shape of UFOs. In fact, I think they were called UFOs. I would try to find those and bring them to an outer space-themed book club meeting or UFO party! Congrats, Sue! You're a winner! I'd bring my heavenly 'Buffaloed' Cauliflower & Butternut Hummus with homemade crunchy bread! Congrats, Johnna! You're a winner! I'd bring a mid-century drink shaker and glasses that have atomic stars on them for the alcohol...an old cheese fondue and wheat crackers as well as spicy bean dip along with a Movie titled "the Man from Planet X." Thank you so much Diane. What a wonderful early Christmas gift! Now I have to decide which book to choose. Merry Christmas and Happy New Year!